Plaines Electric has recognized the benefit of providing secondary containment at electrical substations and choose XR Geomembranes XR-5® for the job. Like many power companies, Plaines Electric has recognized the benefit of providing secondary containment at electrical substations. These substations typically contain numerous oil-bearing transformers which may or may not have very low levels of PCB's. Because substations vary substantially in size, complexity, and the number of transformers, the power company needed a flexible membrane liner that was easy to install in a variety of configurations. XR-5® liner material manufactured by Seaman Corporation proved to meet and surpass the specifications and demands of the application. The flexibility of the XR-5 allows the material to fit virtually any configuration, and the installation requires only simple hand tools and welding equipment. 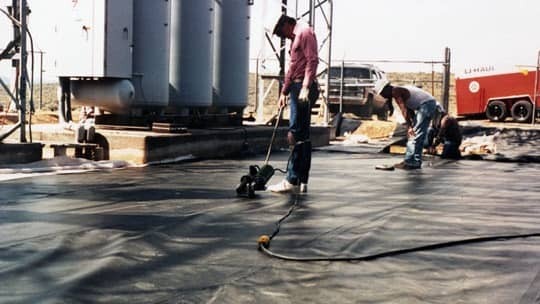 Plus, it's designed to withstand frequent service traffic of heavy equipment, continual foot traffic from maintenance personnel, and the extreme temperature variations in the New Mexico mountains which are detrimental to many liner materials such as HDPE. Meeting these criteria, in combination with high chemical and oil resistance, called for an Ethylene Interpolymer Alloy (EIA) such as XR-5 with a durable substrate fiber to resist puncture and tear.